George Frederick Bodley was an English architect working in the Gothic revival style. George Bodley was the youngest son of William Hulme Bodley, M.D. of Edinburgh, physician at Hull Royal Infirmary, Kingston upon Hull, who in 1838 retired to his wife's home town, Brighton, Sussex, England. George's eldest brother, the Rev. W.H. Bodley, became a well-known Roman Catholic preacher and a professor at St Mary’s College, New Oscott, Birmingham. 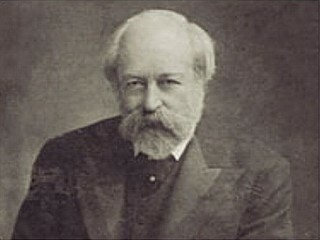 George Bodley married Minna F.H. Reavely, the daughter of Thomas George Wood Reavely, at Kinnersley Castle in 1872. They had one son, George H. Bodley, born in 1874. George Bodley was articled to the architect Sir George Gilbert Scott, a relative by marriage, under whose influence he became imbued with the spirit of the Gothic revival, and he became known as the chief exponent of 14th-century English Gothic, and the leading ecclesiastical architect in England. He is regarded as the leader of the resurgence of interest in English and Northern European late-medieval design. Noted for his pioneering design work in the Queen Anne revival. His secular work included the London School Board offices, and in collaboration with Thomas Garner, the new buildings at Magdalen College, Oxford, and Hewell Grange, Worcestershire (for Lord Windsor). From 1869, he worked in a twenty-eight year partnership with Thomas Garner, designing collegiate buildings in Oxford and Cambridge, country houses and churches throughout the British Isles. In 1906 he designed (with his pupil Henry Vaughan) the cathedral in Washington, D.C., and provided designs (unexecuted) for Grace Cathedral in San Francisco. The only cathedral completed to his design is St David's, Hobart in Tasmania (first design, 1865; revised 1891; building completed 1936). Bodley became acquainted with William Morris in the late 1850s and in the 1860s his commissions for stained glass and ecclesiastical decoration helped ensure the success of Morris's firm, Morris, Marshall, Faulkner & Co., founded in 1861. Bodley is said to have designed two of Morris's early wallpapers. By the late 1860s Bodley had become disenchanted with Morris, and for stained glass turned to the firm of Burlison and Grylls, founded in 1868, for the glass in his later churches, notably St. Augustine's Church, Pendlebury, near Manchester (designed 1870) and the Church of the Holy Angels, Hoar Cross, Staffordshire (designed 1871-72). Bodley worked with his lifelong friend, the stained glass designer Charles Eamer Kempe. They collaborated on projects including: St John the Baptist, Tuebrook in Liverpool; Queens' College Chapel, Cambridge; All Saints, Danehill, East Sussex and Clumber Park Chapel in Nottinghamshire. In 1874, Bodley founded Watts and Co. with Thomas Garner and George Gilbert Scott, Jr. In 1902, Bodley was an assessor for the competition to design Liverpool Cathedral which selected a design by the young Giles Gilbert Scott. When construction of the cathedral began in 1904, Bodley was appointed to oversee Gilbert Scott's work, but had no direct part in its design. Bodley’s final architectural accomplishment was the chapel at Bedford School, the foundation stone of which was laid on 18 May 1907 by Lord St John of Bletso. Building work took a year, the consecration of the chapel taking place in July 1908, by which time the architect had died. Bodley began contributing to the Royal Academy in 1854, and in 1881 was elected A.R.A., becoming R.A. in 1902. In addition to being an architect, he was a draughtsman, a connoisseur of art, he published a volume of poems in 1899, inspiring art works by painters such as John Melhuish Strudwick; and he was a designer of wallpaper and chintzes for Watts & Co. He served as prime warden of the Fishmongers' Company in 1901–02. In early life he had been in close alliance with the Pre-Raphaelites, and he did a great deal to improve public taste in domestic decoration and furniture. George Bodley died on 21 October, 1907 at Water Eaton near Oxford and is buried in the churchyard of St James' Church, Kinnersley, Herefordshire.